Shiratama(白玉) is one of rice cake made from powdered glutinous rice. 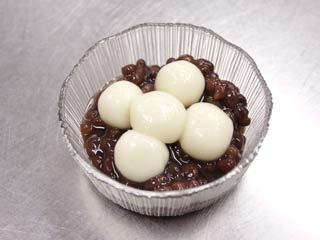 Siratama-zanzai is add Azuki beans to Shiratama. It is typical Japanese sweets. Add little hot water, and mix them. Don't add all water at once, add it little by little. Once it become hard like your ear, then pick up a piece of Shiratama and make it into small ball. First boil them and put them in to cold water. In a few minutes, it will start flowing, then wait 2 more minutes. Then, remove them into cold water. About 1 minute, then remove them into a bowl to drop water off. This time we use Azuki, red been. Put Azuki on a dish, then put Shiratama.